Provogue Records/Mascot Label Group and Joe Louis Walker have announced an October 9 release date for Everybody Wants A Piece. A Blues Hall of Fame inductee and four-time Blues Music Award winner, Walker celebrates a career that exceeds a half a century. His new album cements his legacy as a prolific torchbearer for the blues. This time out Joe has brought on Paul Nelson to produce his album which was recorded at his famed Chop Shop studio on the east coast. Nelson is a Grammy winning guitarist/producer who was rock/blues legend Johnny Winter’s guitarist, and who also appears as guest guitarist on two tracks on Everybody Wants A Piece. 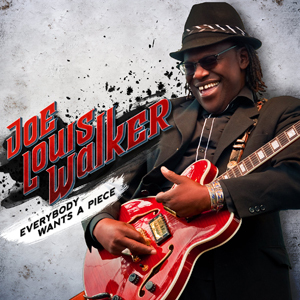 A true powerhouse guitar virtuoso, unique singer and prolific songwriter, Joe Louis Walker has toured extensively throughout his career, performed at the world’s most renowned music festivals, and earned a legion of dedicated fans. Walker’s 1986 debut album Cold Is the Night on HighTone announced his arrival in stunning fashion, and his subsequent output has only served to further establish Walker as one of the leading bluesmen on the scene. Born on December 25, 1949 in San Francisco, at age 14, he took up the guitar. Just two years later, he was a known quantity on the Bay Area music scene, playing blues with an occasional foray into psychedelic rock. For a while, he roomed with Mike Bloomfield, who introduced him to Jimi Hendrix and the Grateful Dead. Walker even made a brief pilgrimage to Chicago to check out the blues scene there. In 1975, burned out on blues, Walker turned to God, singing for the next decade with a gospel group, the Spiritual Corinthians. When the Corinthians played the 1985 New Orleans Jazz & Heritage Festival, Walker was inspired to embrace his blues roots again. He assembled the Boss Talkers, and throughout the 1990s merged many of his gospel, jazz, soul, funk and rock influences with his trademark blues sensibilities on recordings released by Polydor/Polygram. These albums feature Walker’s collaborations with a diverse group of first-rate artists including Branford Marsalis, James Cotton, Tower of Power, Bonnie Raitt, Buddy Guy, Taj Mahal, Ike Turner and Clarence “Gatemouth” Brown. Walker has steadily released recordings since the turn of the millennium, and recently signed to Provogue / Mascot Label Group.